The Blaine County Housing Authority will release its long-awaited study of the need for affordable housing this week at a public meeting in Hailey. The Housing Authority and the ARCH Community Housing Trust commissioned the study and hired Salt Lake City-based Wikstrom Economic and Planning Consultants group to develop the report. The report is a comprehensive overview of the economic state of the county, and how that affects the need for affordable housing. According to the study, more than 41 percent of Blaine County homeowners are considered "housing burdened," which means the household is paying more than 35 percent of its yearly income in housing expenses. 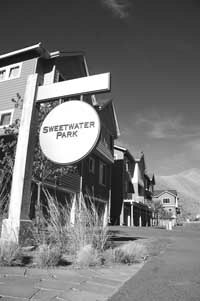 Most of these homeowners are located in Ketchum and Sun Valley, where 48 and 46 percent of homeowners (respectively) are paying more than 35 percent of their incomes on housing. The report states that this number is far above the national rate of 28 percent. The news for renters is slightly better, as only 37 percent of Blaine County renters are considered "burdened." But some of the most revelatory information can be found in the economic sections of the report. According to the section entitled "Employment and Wages," consultants found that the county lost 1,429 jobs between 2005 and 2009. Most of these jobs were in the construction and hospitality industries. Jobs in "Accommodation and Food Services" fell from 2,539 in 2005 to 1,237 in 2009. "This [decrease] can be reasonably associated with a general drop in travel and tourism," the report says. Jobs in health care and manufacturing have risen significantly since 2002, with 1,306 new jobs created in health care alone. The report attributes that growth to the opening of St. Luke's Wood River Medical Center south of Ketchum, as well as the opening of the St. Luke's Clinic in Hailey. According to the report, approximately 1,400 county workers are not county residents, instead living in places such as Twin Falls and Lincoln County where housing costs are cheaper. As a result, the consultants estimate roughly 480 units of affordable housing are needed countywide. "Of those needed units, virtually all are for those with incomes less than 50 percent of [the area median income]," the report said. The Blaine County Housing Authority currently manages 92 affordable-housing units. The housing needs assessment will be discussed at length at a public meeting at 1 p.m. on Thursday, Dec. 1, on the third floor of the Blaine County Courthouse in Hailey. Housing Authority programming director Nancy Smith said the public is welcome to attend. Interested parties can obtain a full copy of the report by emailing programdirector@bcoha.org.